When I tell people that I must turn to funerary art (monuments and brasses) to document early Tudor garb, they often ask why I do not use painted images such as portraits and illuminations. I answer that I would, if only there were any such sources for me to consult. Because of the excellent and numerous portraits created by Hans Holbein the Younger at the court of Henry VIII, people frequently assume that portraiture from the reign of Henry VII must exist as well. Unfortunately, little was apparently commissioned and even less remains. The best collection of Tudor portraits is at the National Portrait Gallery and excellently documented online. Unfortunately, most of the portraits they have of the early Tudor era are copies from the late 16th-18th centuries. The oldest portraits they own are of men: Henry VII from 1505 and Henry VIII circa 1520. There are also several original paintings of Henry VIII from later in his life. 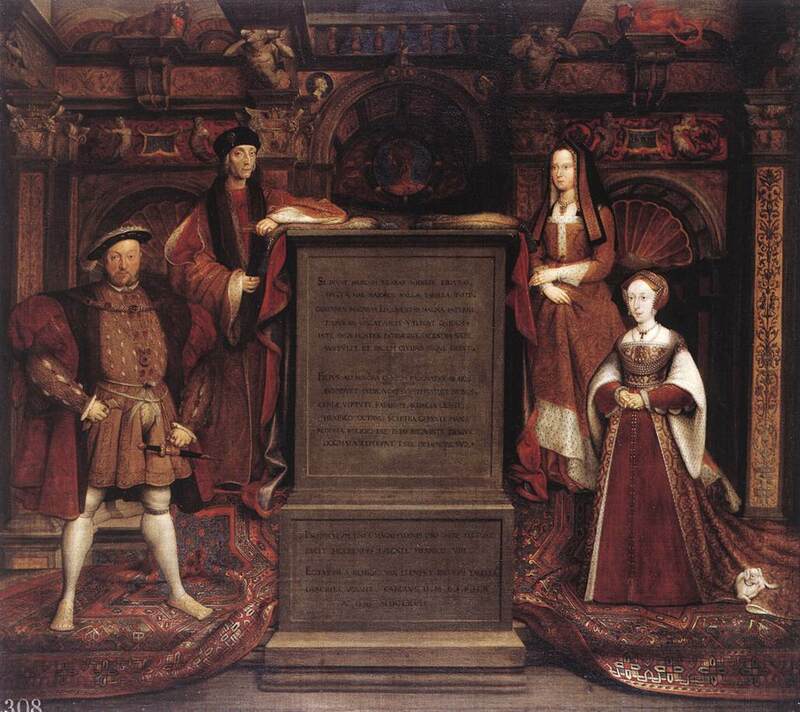 Even the huge cartoon by Holbein of the Whitehall Mural only shows the half with the kings, not the queens. The second best collection is supposed to be that at Hever Castle, Anne Boleyn's childhood home. I have not yet visited it, but the curator who answered my email told me that a 1509 portrait of Arthur, Prince of Wales (Henry VIII's deceased older brother and Catherine of Aragon's first husband) is the only portrait they have painted before 1520. Their other portraits of early Tudor nobility are copies made well after the sitter's lifetime. The portrait of Elizabeth of York that I know so well is from the late sixteenth century. I find the text on the NPG page describing it frustrating but I've even written to verify that I understand it correctly, and "oil on panel, late 16th century (circa 1500)" means that the painting they have is from the late 16th century, but it is based on a (now lost) portrait from circa 1500. However, it is a starting point, and gives clues as to the neckline (square), gown closure (front), sleeve shape (tapering to fit the arm, with a fur cuff at the wrist). These details match what I see frequently on brasses. The headdress is difficult to interpret, being black against a dark background. An earlier version (1502-1550) of this same portrait is on display at Hampton Court Palace, as is the painting of the Family of Henry VII with St. George and the Dragon, dated 1503-1509. The former suffers from the same black-veil-on-dark-background issue, and the latter obscures the women's gowns with cloaks and bonnets with crowns. I can better interpret the folds of her bonnet and veil on the copy of Elizabeth's effigy (Pietro Torrigiano, 1512-1518) on display on the National Portrait Gallery's front stairs. Although the original effigy is in Westminster Abbey, it is all but invisible behind a decorative metal screen. Margaret Beaufort's portrait is also a late 16th century copy of an earlier work. Her headdress is different in both color (white instead of black) and shape (the back of the veil is curved and shaped like her head, not laid over a rigid undercap), from Elizabeth's because she was a vowess when it was painted. This is similar to the variation seen in other widows' veils, mostly depicted on brasses. It differs somewhat from the shape of bonnet that she wears on her effigy (Pietro Torrigiano circa 1514), which I photographed at Westminster Abbey. The next queen of England, Catherine of Aragon, does not seem to be painted in the same style as her mother-in-law Elizabeth. She showed up in England wearing Spanish fashion (Michael Sittow 1502) and by the 1525-1526 miniature by Lucas Horenbout (or Hornebolte) she had adopted the English gable, but already wore it with the frontlet flipped up, not down on her chest. In this remarkably different 1525 Horenbout minature she wears neither the same gown style nor a similar bonnet to Elizabeth of York. In some ways this is not surprising, since more than 20 years had passed since Elizabeth's death. However, monumental brasses of the 1520s usually look quite like the former queen's portrait and almost never mimic the current queen's fashion. Henry VIII's later wives only move further from the fashions of 1500, displaying rigid torso support, full sleeves, and French hoods in their portraits. There does not seem to have been a portrait painter active in Henry VII's court; only his wife, mother, and sons are memorialized during this time. His mother-in-law Elizabeth Wydeville or Woodville, queen consort of Edward IV and mother of Elizabeth of York, was painted circa 1471. However, I know of no other surviving portraiture from 1475-1520 depicting English women.